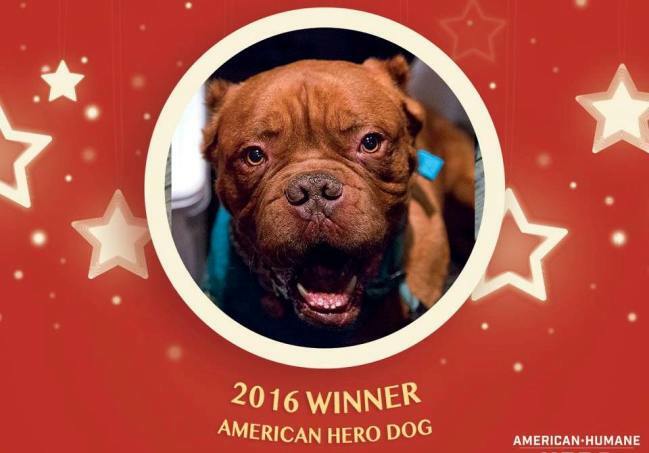 Hooch, a French Mastiff with badly cropped ears, a broken tail — and no tongue to make him a better bait dog in dog-fighting rings — was announced as the American Hero Dog of 2016 at last night’s sixth annual American Humane Association (AHA) Hero Dog Awards ceremony. That’s for sure. Over the past five years, millions of votes have been cast online for nearly a thousand dogs competing for the award. The program reaches more than 1 billion people each year. Hooch was the finalist in the Emerging Heroes category, which honors ordinary dogs who do extraordinary things. When the starving, skittish dog who’d been taken in by a shelter refused to eat, instead thrashing his food and water bowls around “like a maniac,” according to the AHA, a veterinarian discovered his tongue had been cut off at the base. Zach Skow, of Marley’s Mutts Dog Rescue in Tehachapi, Calif., adopted Hooch. He nursed him back to health by hand-feeding him, which he still continues to do. Patient and gentle, Hooch is now a therapy dog with Marley’s Mutts’ Miracle Mutts, helping autistic, abused and special-needs kids. He’s living proof that it’s possible to overcome any adversity. Last night’s ceremony was dedicated to Harley, the winner of the 2015 Hero Dog Award. Harley, a 15-year-old Chihuahua who spent the first 10 years of his life in a puppy-mill cage before becoming a “spokesdog” against these cruel facilities, died in March. Save the date: The AHA Hero Dog Awards is scheduled to air on the Hallmark Channel on Oct. 28 at 8:00 p.m./7:00 p.m. CT.
Hooch and his dog dad, Zach Skow. These were the finalists in the other Hero Dog Awards categories. To help hero dogs everywhere, AHA will donate $2,500 to each finalist’s charity partner, and an additional $5,000 to Hooch’s charity partner, Pets for Patriots. As an arson K-9 with the Allentown Fire Department in Pennsylvania, 7-year-old Judge, a Labrador Retriever, has worked 275 fire scenes over the past five years. The evidence Judge discovered has led to many arrests and civil penalties for insurance fraud cases, and the number of arson fires in the city has dropped nearly 53 percent. Judge is currently participating in a pilot program to provide autistic children with lifesaving information. Ten-year-old, 12-pound Hook is a hearing dog for his handler. As the two walked across train tracks in Sacramento, Calif., the woman couldn’t hear an oncoming train. Hook began jumping on her, alerting her to the train and saving her life. He is always by the side of his handler, who’s a family therapist. Whenever her patients are upset, Hook will jump into their laps to comfort them. Hook also chased off an intruder who broke into the office. K9 Roo is a ballistics/bomb dog with the Boston Police Department. After the 2013 Boston Marathon bombing, Roo searched for secondary devices and was the only police dog there for the capture of Dzokhar Tsarnaev. During his career — Roo is retiring this year — he recovered 12 firearms (three had been used in homicides) and more than 300 shell casings involved in shootings. Roo answered at least 200 calls to investigate suspicious packages. When he’s not working, Roo visits children in hospitals and performs demonstrations at community events. In 2012, as Layka’s team fired on an enemy compound in Afghanistan, rifle fire was returned from the compound. Layka was sent inside to look for combatants and explosives. She was hit with four rounds from an AK-47 in her right shoulder. Layka was rushed to a location where medics worked on her, and then flown to a base where her right front leg was amputated. After additional surgeries, Layka was medically retired from service three months later. Kobuk, a trained and certified member of the non-profit Maine Search and Rescue Dogs team, found a 77-year-old woman suffering from diabetes and dementia who had been lost in the woods for over two days without food, water or her medications. Running almost a quarter mile into the woods, Kobuk spotted the woman and then ran back to alert his handler, and ran back with him into the woods to rescue the woman in time to save her life. Gander, saved from a Colorado shelter and trained by a women’s prison program, is now a service dog and was the first mixed breed to win the American Kennel Club’s Award for Canine Excellence (ACE). He and his handler travel the country to raise awareness of PTSD, veteran suicide, service dogs, and people with visible and invisible disabilities. They have helped raise a million dollars for veterans’ groups, veterans, service dog charities and people in need. As a stray, Mango was hit by a car, paralyzing her rear legs. She was going to be euthanized by a shelter when Emma’s Cleft Palate Chihuahua Rescue stepped in. Mango is now a therapy dog for her dog mom, a veteran. They participate in the Emma’s Rescue Reserve program, in which paralyzed dogs work with disabled veterans, showing them that if a small dog in a wheelchair can overcome her handicap, then so can they. Mango’s Freedom Wheels, named in her honor, has donated over 150 custom-built wheelchairs to help other animals become mobile.